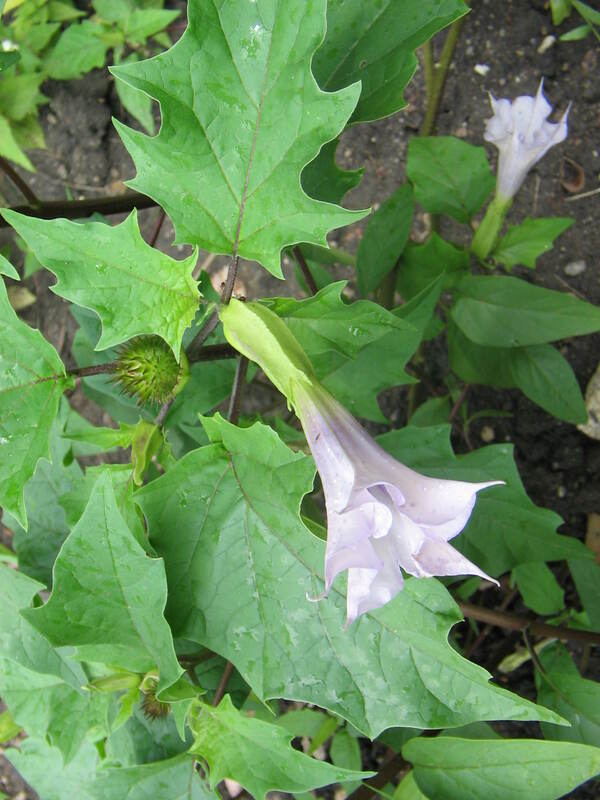 Datura stramonium. (2005_07_07) plant in bloom. en.wikimedia.org (Accessed 2/2018). 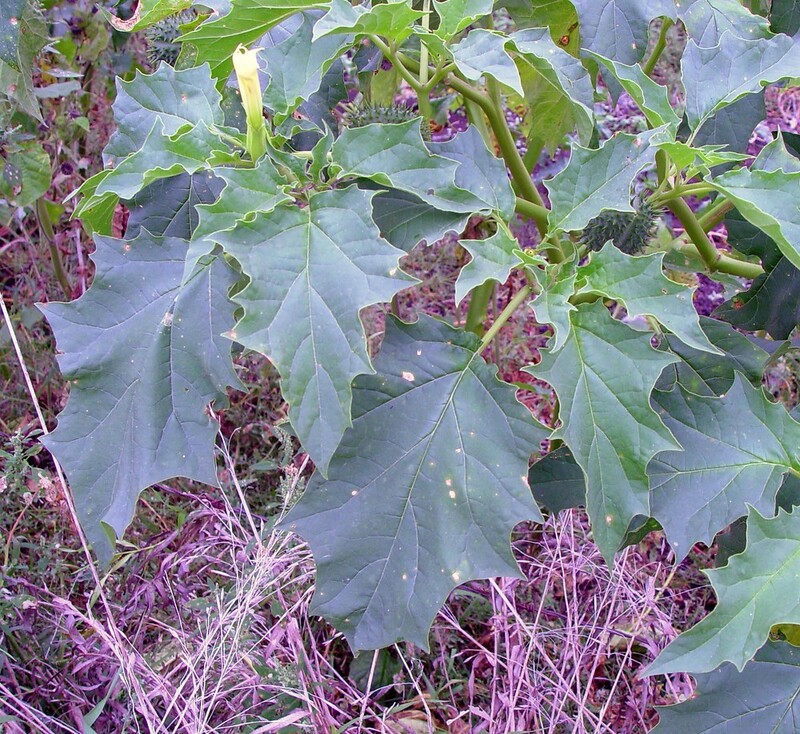 Datura stramonium is a summer annual, coarse, to 1.5 m (usually less), often branched. Datura stramonium leaves. By Arthur Haines. Copyright © 2018. New England Wild Flower Society. gobotany.newenglandwild.org (Accessed 2/2018). Leaves alternate, stalk to 12 cm long, blade to 25 cm long, 25 cm wide, broadly ovate to elliptical, margin, irregularly few-toothed to shallowly lobed. Datura stramonium flower. commons.wikimedia.org (Accessed 2/2018). Flowers white or purple, radially symmetrical, showy, trumpet-shaped tubular, to 10 cm long, shallowly 5-lobed, lobes pointed, calyx ca 4 cm, narrowly 5-winged, solitary in axils. Flowers last one night, self-fertile before opening, anthers overlap stigma, rate of outcrossing <10%, flower opens late in day, pollinated by insects when open; odiferous, producing copious nectar. Visited by bees during day, hawk moths (Manduca sp.) at night (Motten and Antonovics 1992); July-Oct..
Fruit a green, capsule, densely spiny, oval, to 7 x 5 cm; splitting in four parts to release up to 700 seeds; seeds dark brown, 0.4 x 0.3 cm; capsule photosynthetic and buoyant in water. Seeds may be eaten by small mammals (Martin et al. 1951). Plants eaten by the beetles Lema trilineata and L. trivittata. Tobacco hornworm larva (Manduca sexta). 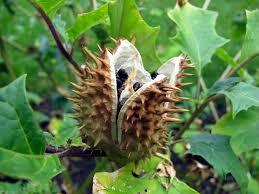 Fungi occurring on Jimsonweed include leaf spot, pod blight; Alternaria crassa, and several others. It is also attacked by a number of viruses including Datura mosaic virus (Weaver and Warwick 1984). Origin Asia. Listed by USDA.plants as introduced (USDA, NRCS 2006). Now found worldwide. Habitat: Disturbed, dry soil, sandy fill, open areas, especially along beaches above high tide line. Sometimes in other fill soil from seed. Notes: Poisonous, producing several tropane alkaloids that are neurologic toxins that can be fatal, including scopolamine, hyoscyamine and atropine that have been used medicinally (Weaver and Warwick 1984). Total alkaloid content as much as 0.7 %. 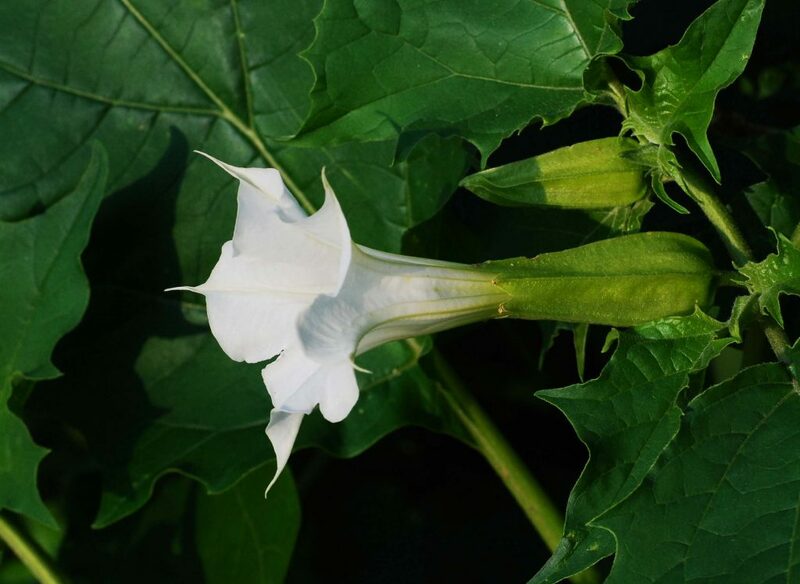 The genus Datura has been known as poisonous from classical times (Kingsbury 1964; Russell et al. 1997).